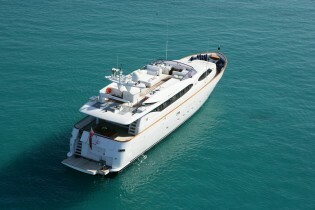 Charter Yacht TALILA available with 10% discount in Mallorca – Superyachts News, Luxury Yachts, Charter & Yachts for Sale. 29m Mondomarine motor yacht TALILA is offering a 10% discount for the remaining availability of July 7 – 13, in Palma Mallorca. Contemporary interiors invite a relaxed ambience, featuring neutral tones throughout. Her salon offers a generous lounge with ample seating, coffee table and entertainment systems. Forward there is a formal dining area, in a semi-open plan arrangement. A separate bridge area has the yachts navigation area and additional seating. Below decks are 4 guest cabins. Her exterior living spans 2 levels, comprising an aft deck with shade, seating and alfresco dining, this area is adjacent to the main salon and is ideal for socializing. On the upper deck are sun pads, seating and alfresco dining. For the water enthusiasts, an extended swim platform on the transom, ensures the toys on offer are easily enjoyed. Accommodation is on the lower deck in 1 master stateroom with a full beam layout, 1 VIP cabin with a full beam layout, plus 2 twin cabins, each with a Pullman berth. All cabins have private en-suite facilities. Twin MTU engines power charter yacht TALILA achieving cruising speeds of 17 knots and top speeds of 21 knots.